Posted on 25, May 2016 by EuropaWire PR Editors | This entry was posted in Aviation & Aerospace, Education, Electronics & Machinery, France, Technology and tagged Andrea Debbane, Dr. Masoud Habibi, initiative to train students in robotics and resilience techniques, The Airbus Foundation, the Iranian Red Crescent Society. Bookmark the permalink. TOULOUSE, 25-May-2016 — /EuropaWire/ — The Airbus Foundation and the Iranian Red Crescent Society (IRCS) unveiled a joint initiative to train thousands of Iranian teenagers aged between 12 and 14 in robotics and resilience techniques, developing their skills to respond to disasters and ensuring safer and more resilient communities for the future. The programme, which rolled out in April in Tehran as a pilot, will include three IRCS youth centres in Tehran this year, and expand to Isfahan, Mazandaran and Golestan in 2017, followed by Fars, East Azerbaijan and Lorestan in 2018. The Foundation and the Iranian Red Crescent aim to reach more than 6,000 participants by 2018. The IRCS will bring its network of 400 branches in 31 provinces to bear in expanding the reach of the Airbus Little Engineer (ALE) programme among its youth members across the nation. The collaboration agreement between the Airbus Foundation and the IRCS focusses on the popular ALE programme, an initiative dedicated to instilling an appreciation for Science, Technology, Engineering and Mathematics (STEM) among the youth in the region. The ALE programme aims to inspire and engage students through robotics and aerospace workshops and ultimately contribute to creating a sustainable stream of talent for the region. Originally designed as a one-day aerospace workshop for teenagers, the ALE Iran programme has been expanded into a seven-week module focusing on the humanitarian needs in times of disaster. The module was developed in cooperation with the IRCS and is based on its expertise with earthquakes and other disasters in Iran. Participants in each group will be trained in core humanitarian mission areas including establishing communications in the wake of a disaster, relief and rescue operations, managing supplies and logistics and ensuring equilibrium. The programme operates on four levels: first, training 12- to 14-year-olds in robotics, boosting their STEM skills; second, in disaster management, improving students’ understanding of and response to risk reduction, preparedness and relief; third, building a network of engineering students to serve as mentors and trainers; and fourth, building resilience in both sets of students. The Airbus Foundation works with more than 30 non-profit organisations all over the world, including the International Federation of Red Cross and Red Crescent Societies (IFRC) to support humanitarian causes and inspire young minds to embrace science and technology for a better tomorrow. 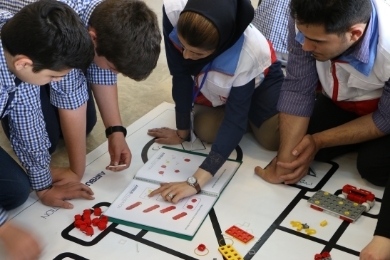 The Airbus Little Engineer programme in Iran is the latest iteration of the global partnership agreement between the IFRC and the Airbus Foundation. The Iranian Red Crescent Society is a humanitarian organization established in 1922 and acts based on the laws of the Islamic Republic of Iran. The IRCS mission includes effective contribution to protection and promotion of human dignity, improving the life of vulnerable people and those affected by disasters and crises and strengthening peace and friendship at international level. As a member of the International Federation of the Red Cross/Red Crescent Societies, the IRCS serves as an auxiliary to the Government of the Islamic Republic of Iran in the humanitarian fields such as disaster risk reduction, promotion of humanitarian laws and values, providing rescue, relief and medical services to the most vulnerable and disaster-affected people enjoying over 2 million active members and volunteers and 50,000 active relief workers respond to domestic and international emergencies. The Airbus Little Engineer programme aims to inspire and engage students through robotics and aerospace workshops.